While two newlywed couples are enjoying a charter boat cruise along the Caribbean, an unlikely honeymoon turn comes their way. Passing through a storm, the boat emerges off shore of the mysterious island of Caprona. On the island, the couples get stranded with supposed-to-be extinct inhabitants, including dinosaurs and the crew of a stranded German U-boat. The newlyweds, along with the charter boat’s captain and the Germans, must battle a variety of obstacles to escape the island and get back to their own time. 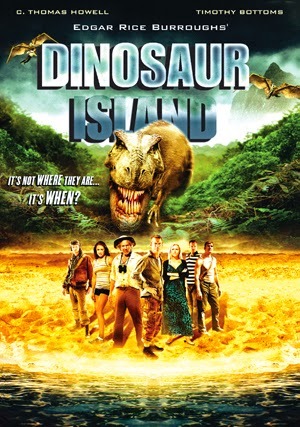 Released in 2009, the film was promotionally titled “Edgar Rice Borrough’s The Land That Time Forgot and released in other countries as Dinosaur Island. Produced by independent American film studio The Asylum, the film is an adaptation of the 1918 Edgar Rice Burroughs novel of the same name, and a remake of the 1975 film. If you hear this plot, you may find it hard to believe. It’s like the Bermuda Triangle, or other pseudo-scientific, unexplainable phenomena that conspiracy theorists love to speculate about. However, you don’t need to believe a plot to enjoy a story. Give it a chance, suspend your disbelief, and you may just find the characters loveable enough to root for as they struggle to get home.